My recent move to Boulder from Austin, Texas left me with a serious withdrawal from Mexican food, and of course, margaritas. Research and word of mouth led me directly to the front door of Comida, a Mexican food restaurant in Longmont, only a hop and a skip away from Boulder. 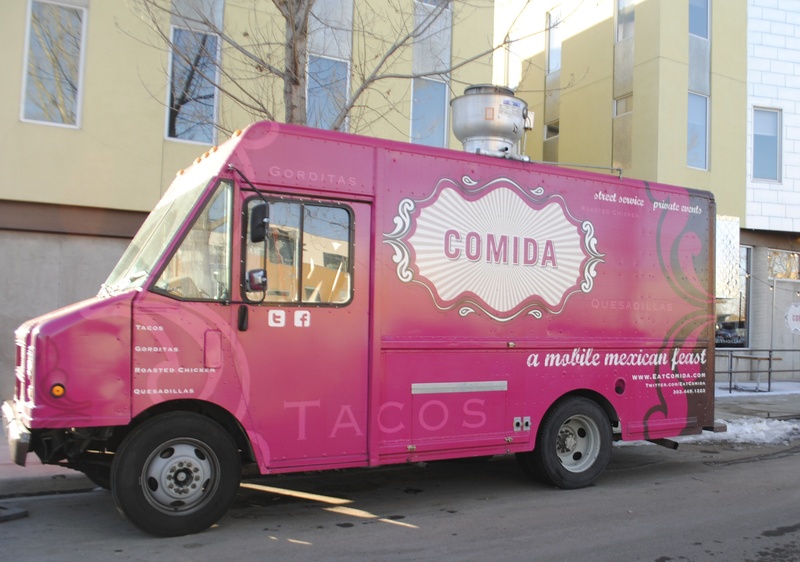 If you’ve seen a brightly colored fuchsia food truck strolling along the streets of Boulder, then chances are you’re probably more familiar with Comida, a street-style food truck turned cantina, than you thought. 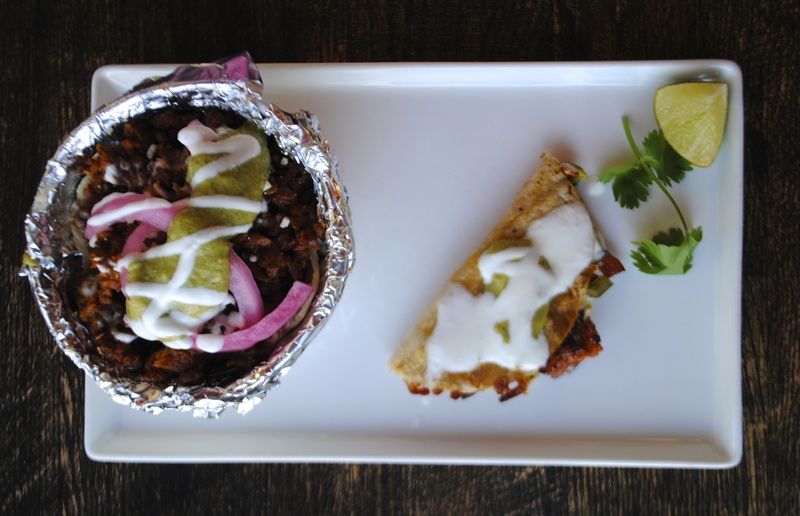 Comida dishes out Mexican-meets-Southern food through their food truck window and two restaurant locations, in Longmont and Denver. Previously, the street-style dishes were exclusively served through the window of Comida’s truck. Luckily, the extension from 4 wheels to brick and mortar allows the Comida-cravings to no longer be confined by the truck’s schedule. 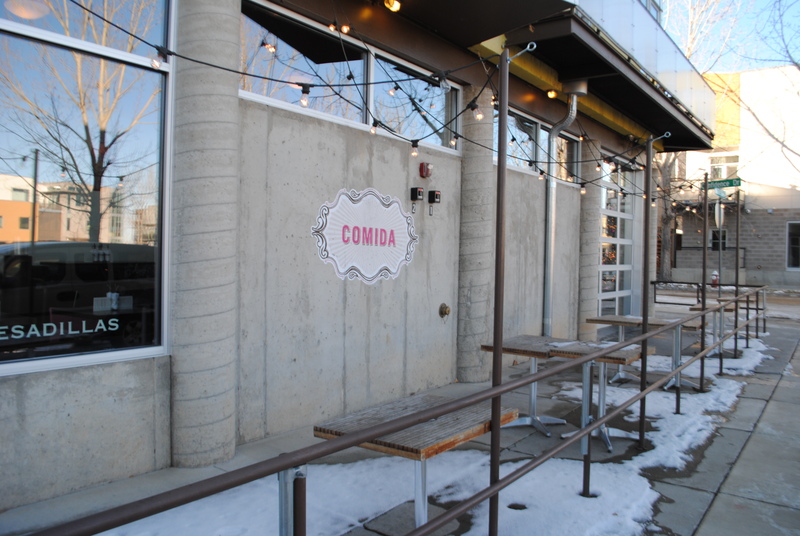 Comida found its first cantina-home in the Prospect district of Longmont in 2012, and a little over a year later made its way into the bustling marketplace in Denver known as The Source. I visited the Longmont location, which is only a short (yet scenic) drive from downtown Boulder. Best part about the short drive? My eager, and growling Texas tummy didn’t have to wait very long. Upon entering the restaurant, I was drawn to the lavish bar, a balance of clean, contemporary edges, and scholarly design. Sitting atop the bar stools, I felt as though I had been transported to a liquor-library. Deep-colored wood shelving houses a wide array of tequila, and other liquors, including Comida’s selection of house-infused tequilas, with a wooden sliding ladder allowing one to reach the tip-top tequilas. Along the front wall is a garage-style door, opening up to a small outdoor patio. It can’t help but make you wonder whether their big pink truck is hidden behind the swinging kitchen doors. The signature fuchsia color of Comida’s truck is sprinkled through the interior of the restaurant. Parts of the ceiling, light fixtures, and chairs wear the brightly pink color, as if it were a suit of pride. 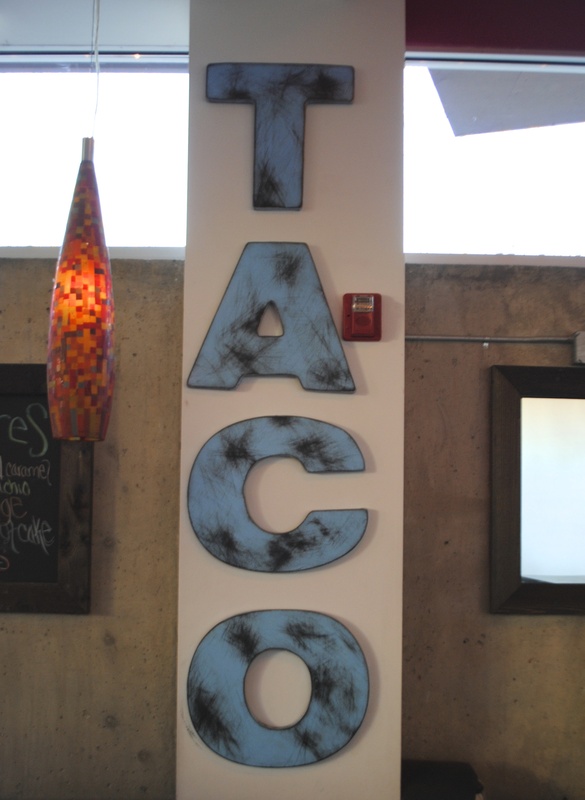 One piece of décor displays their famous dish – the taco. 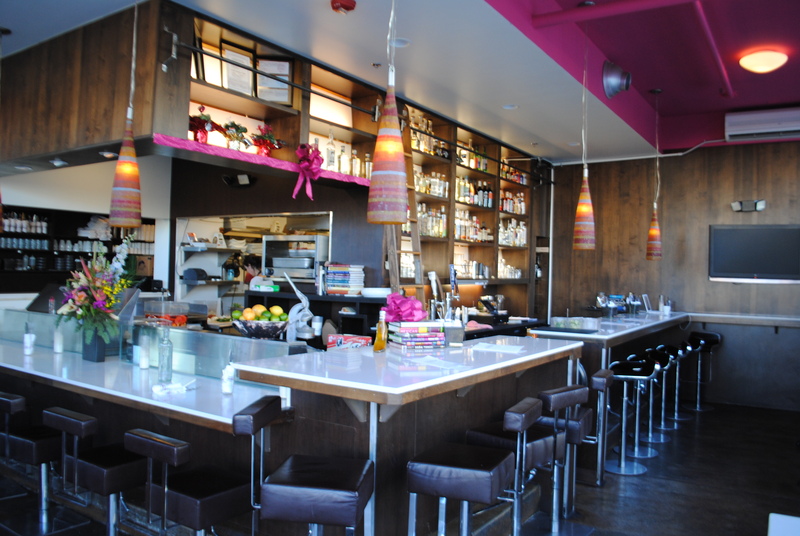 The vibrantly colored décor is matched with modern design, creating an upscale, yet comfortable and tasty, atmosphere. The drink menu makes a Texas-born girl feel right at home. 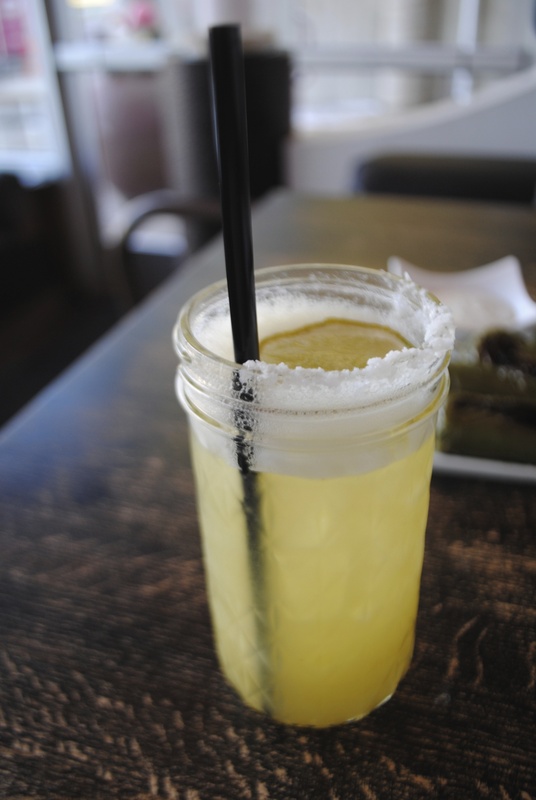 The margarita list was peppered with interesting combinations, including a Pineapple Habanero Margarita, a Watermelon Jalapeno Margarita, a Smokey Sombra Margarita and an Agua de Jamaica Margarita. If I could, I would have ordered one of each. My spicy tendencies led me to order a Pineapple Habanero margarita. Freshly pureed pineapple is mixed with house-infused habanero tequila, a must for anyone who loves a little bite to his or her drink. In addition to their margaritas, Comida also has an array of creative mixed drinks (divided into ‘What’s Up’ and ‘The Rest,’ on the menu). Beer, wine, spirits and tequila flights are also available. According to Comida’s menu, the food found inside is just that: food, plain and simple. Several ingredient concoctions are recreated into different styles of dishes – from tacos, to tortas, to quesadillas and more. 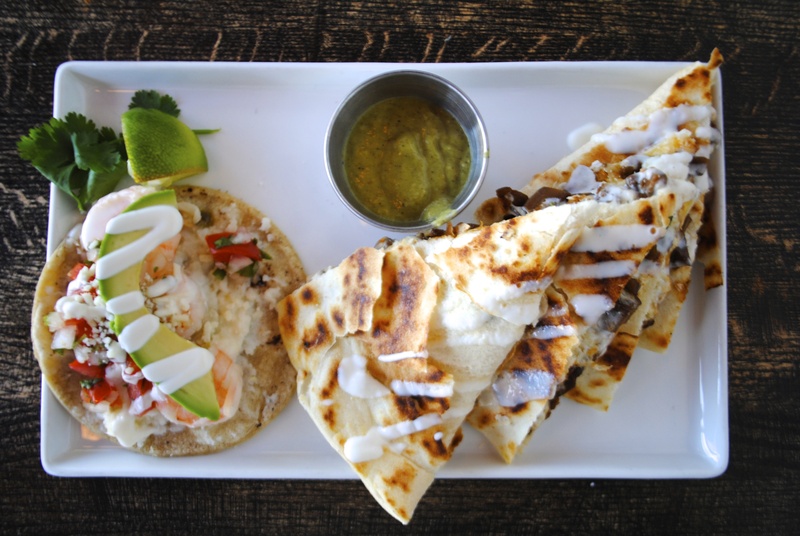 Comida’s menu is complete with a la carte-style dishes: including antojitos, tacos, tostadas, gorditas, quesadillas, and tortas. The reasonable prices (from $2.50 to $10 each) allow you to order several plates, tasting a little bit of everything – a desire I have at just about every restaurant. 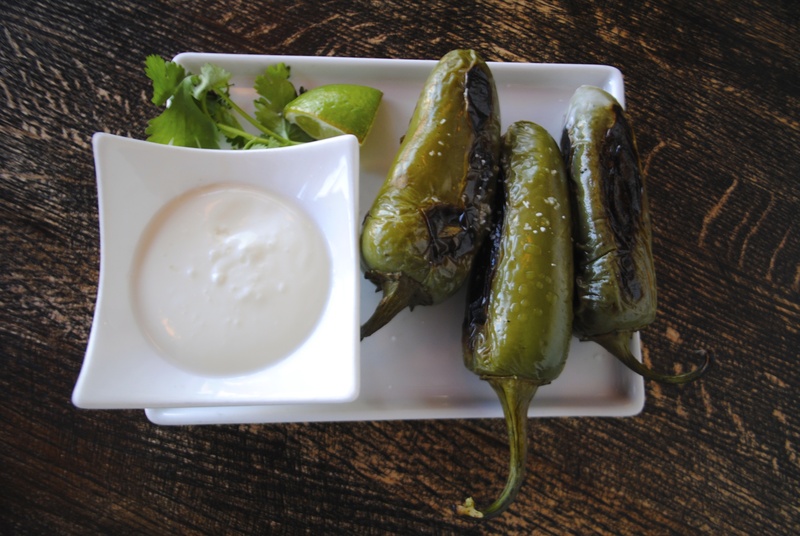 We started with the Salty Roasted Jalapenos, one of their “Antojitos” or street snacks. We also couldn’t resist the Chips and Comida Salsas, a choice of 3 of their 6 house-made salsas. Next, we ordered a Bacon and Jalapeno griddled taco and a Chorizo and Onion gordita. Both dishes revealed unique flavor combinations, and presentation. The gordita, a soft masa pocket packed with fillings, was served in a small bowl to keep all the ingredients enveloped together. Lastly, we ordered a ‘Camerones a la diabla’ taco and Sombra Shroom Quesadilla. Both were my personal favorites, especially the quesadilla. The slowly cooked mushrooms paired with the melted cheese and toasted tortillas, were amazing. Go. Immediately. I had a great experience, and will return again very soon. It could be the Texas talking, but the drinks and the food is return-worthy. Just finished reading this, now hungry, very hungry. Thirsty, too.